We at Root Division love to create the opportunity for solo exhibitions of our Studio Artists‘ work at partner offsite spaces! 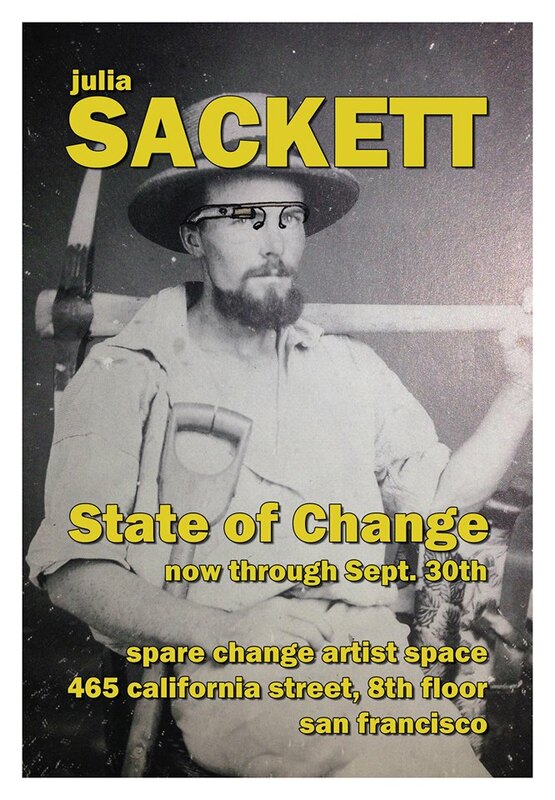 Julia Sackett’s State of Change, is a new body of work currently on display at the Spare Change Artist Space. 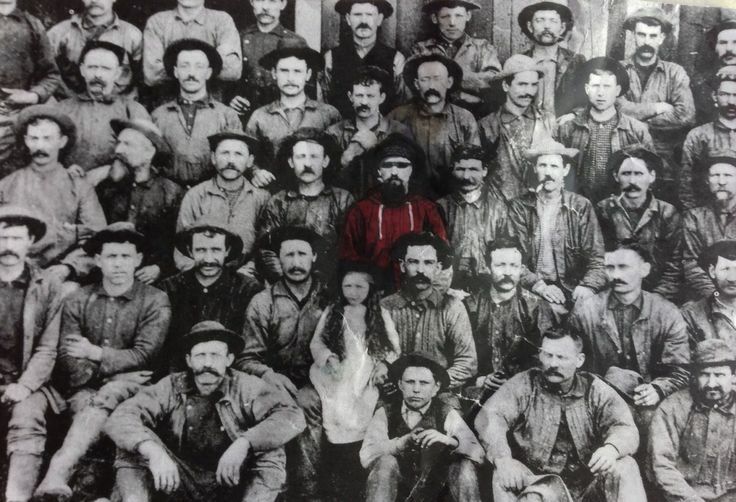 In playful work informed by is the historical facts of California’s boom and bust economy, Sackett connects and visually conflates the current tech boom in San Francisco with the historic Gold Rush. The result is tongue in cheek critique with careful consideration of the historical significance of both booms. In each of these historical moments thousands of young men rush from all over the world to San Francisco to try their hand at making a fortune. According to Sackett, “Most are between the ages of 18 and 30; most are unattached. They have risked it all to stake their claim, and with dreams of easy money, legendary saloons and loose women, they flock to the streets of San Francisco. They will change this place forever.” By modifying historical photos, and creating cast sculptural objects of timeless San Francisco significance–namely a wallet and a pair of Levi’s–Sackett brings levity, and historical significance to our current economic climate. In keeping with our quarterly ritual, we’ve asked the last artist to exhibit at Spare Change, to interview the current artist. Former Root Division artist Mie Hørlyck Mogensen (whose work can currently be seen at Root Division’s main gallery as part of Introductions 2014) interviews current RD Studio Artist Julia Sackett about this new body of work below. To hear more about Julia’s work and to see the exhibition in person, join us this Thursday, July 25th in the Financial District at the Spare Change Artist Space (465 California St., suite 838 San Francisco, CA 94104) for an artist talk & reception 6-8 pm. We hope to see you there! -Amy Cancelmo, Curator, Exhibitions & Events Director, Root Division. Mie Hørlyck Mogensen: You seem to be very interested in history. 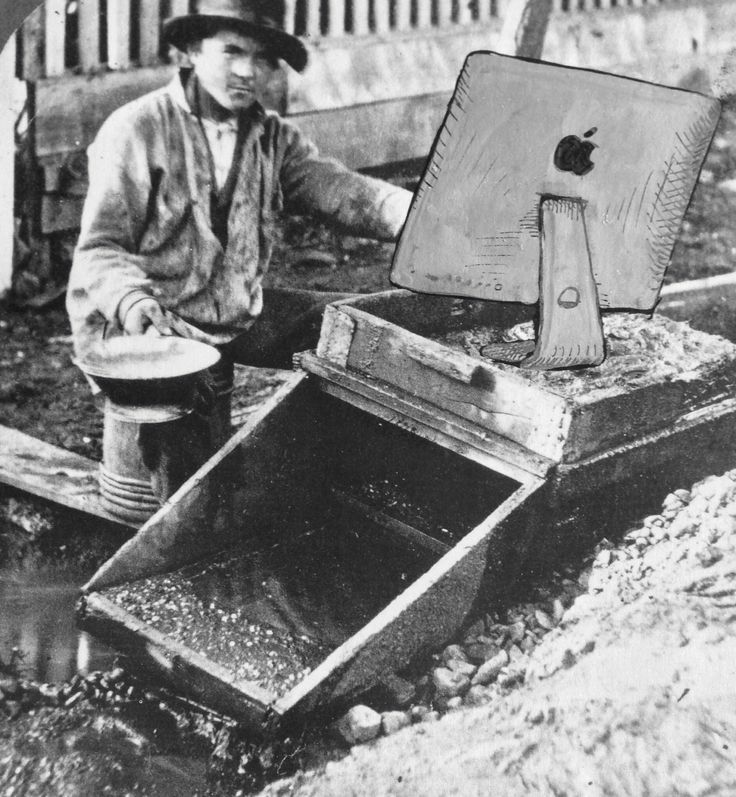 For this show you draw a comparison with Gold Rush California and the tech bubble we see today in San Francisco. To me it seems like you are melting the past and the present into one. What is your relationship with history? Julia Sackett: My relationship with history is a lifelong friendship. As a kid I was obsessed with history, especially disasters. The Titanic, Pompeii, the Holocaust were all at the top of my list. I also loved mummies and bones. I remember specifically reading a National Geographic issue on Ötzi the Iceman, a mummy found on the Alps in 1991. What fascinated me was the way the archeologists pieced together such a full portrait of the man from scraps of leftover information, like stomach lining. Then, and now, the history I love the most is the minuscule details of life in the past. What did people pee into? What did socks and shoes look like? What did people eat? The history that I like is the small stories or ordinary people that flesh out the bones of great events. I like playing with the aesthetic of history. A fascinating thing happens when historic photographs are colorized–they become real. With color that matches the color we can recognize from our living time, the photographs become individuals the viewer can empathize with. To some extent, that was my intent with the State of Change images. I’m trying to free the real people from the period aesthetic they’re trapped in. Go West, man, 2014, Textbook image, marker, pen , 14 x 16 in. MHM: Tell me about your process in making both images and objects: How do you select the images that you work with? – what thoughts come mind when you choose them, and what are your criteria (if you have any)? JS: In general, when I select the photographs I want to work with, I look for the mystery. The appeal of these snapshots, in my opinion, is the stories they suggest and the questions they invite one to answer. In some of my imagery, like the photos selected for State of Change, I do know some information because the images are known historical documents. Of course, as a historian and as an artist, the narrative I can offer will never come close to the “truth” of the story, but I think that futility is why it continues to be appealing. APPS, 2014, Textbook image, marker, pen, 16 x 14 in. 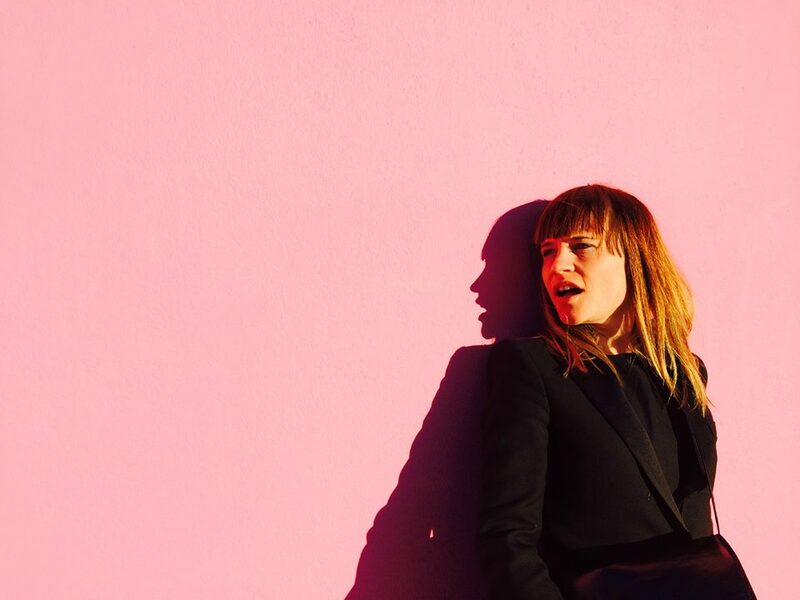 MHM: what is your relationship to the people in the photos – are they somebody you know, or know of? – and how does your relationship to those people/existences evolve as you work with the images? I’m curious to hear more about that process. 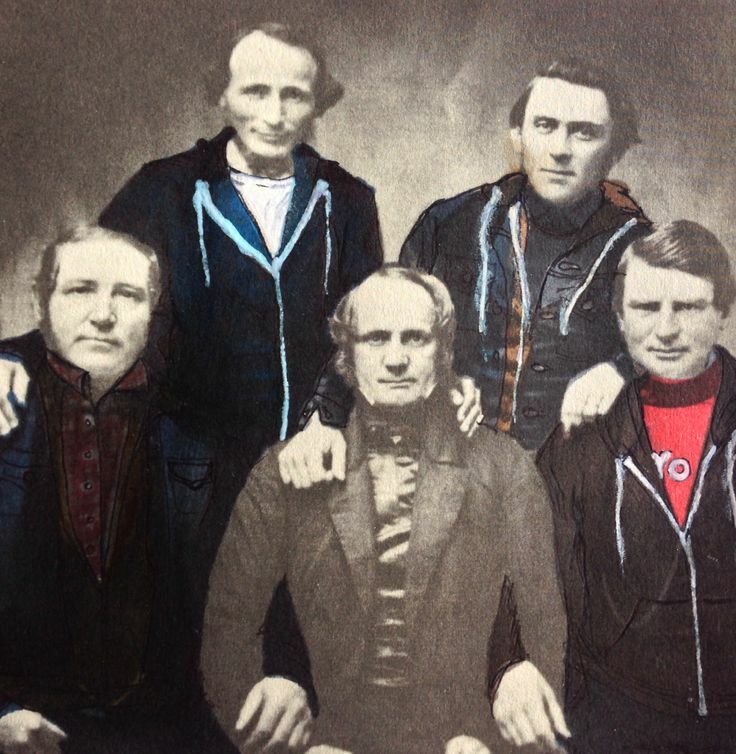 JS: My relationship with the snapshot people is completely imaginary, from photos of family members to people I find in the thrift store bins. Even if it’s a snapshot of my dad in the 70’s…I still don’t know that person. The story I make is based on anthropological deductions, like the type of camera used, the clothes, the setting, the hairstyles. I study expressions. All of these pieces of the story engage me. Startup, 2014, Textbook image, marker, pen, 10 x 8 in. MHM: I sense a certain darkness and a humor at the same time in your work–can you comment on this? JS: I feel more comfortable using humor with images that have been in history books; they are part of the public dialogue so it feels less like a desecration to draw Google Glass on their faces. After the Gold Rush, 2014, Gold Rush imagery, marker, 14 x 11 in. 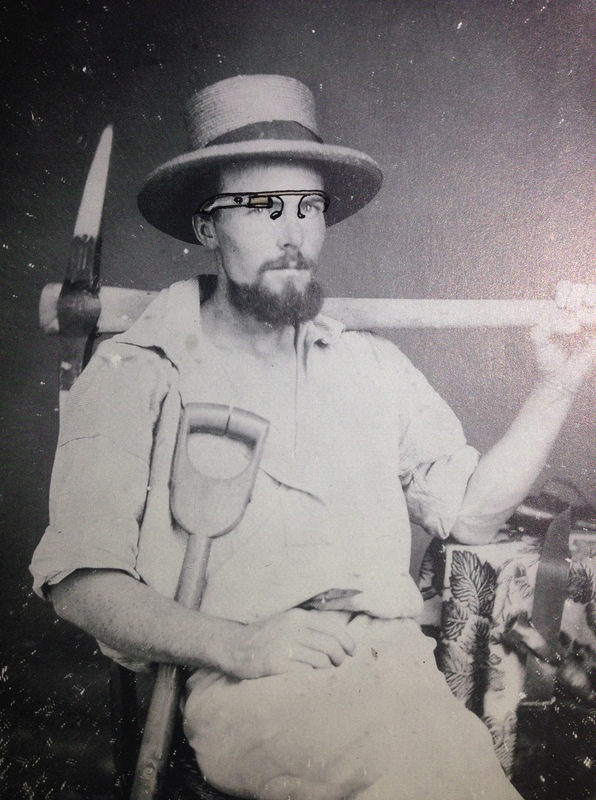 MHM: I keep thinking about the portrait of the prospector with the Google glasses. There is something innocent about him, sitting there in his chair with all his tools and then the goofy Google glasses. How would you describe this person? –is he to be taken seriously–is he vulnerable–or strong–or even a little bit stupid, or naive? Are you critiquing? JS: This guy is all these things; vulnerable, naive, optimistic, and a small cog in a greater historical movement. 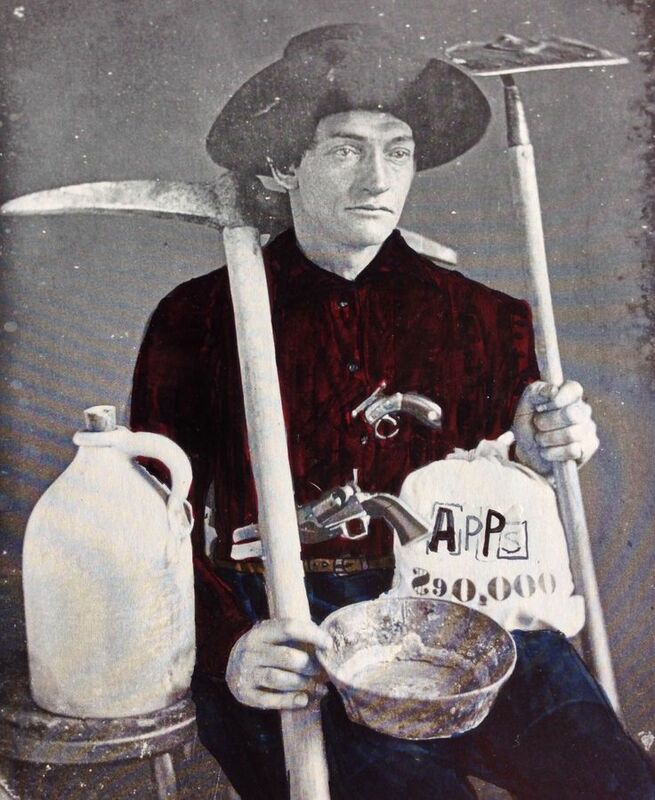 The 1840’s version of the prospector would have faced incredible challenges to have even made it to San Francisco, and his 2014 counterpart might have faced adversary as well. I’m not critiquing the individuals so much as the time they represent. This guy, in both histories, is gutsy and young and isn’t interested in claiming responsibility for his role in changing the character of his new home. I want to point the finger at that lack of accountability. The tech industry is obsessed with the future, the new and better, The State of Change series is a gentle reminder that nothing is really new. All booms gotta bust. MHM: What impact do you think gold rush, booms etc. have on the human civilization? and to certain physical locations – like California? JS: Of course, I don’t know why San Francisco is a place with a Boom/Bust character. The Golden Gate represented the end of the known world in 1849. Maybe because it’s the advent horizon of the country, that capitalism plays out here in innovative and unsustainable ways. Certain landscapes have a tendency to foster their people’s character. I feel that way about New Mexico, where I grew up, and I feel it in California too. MHM: Your [sculptural] objects are made out of this material that turn photos and papers transparent and you can see through layers of writings and images. How do you achieve the effect and what does that transparency do to the objects and images of yours? JS: The process is something of a hybrid between acrylic transfer and casting. Acrylic transfer is pretty simple; the acrylic medium, or acrylic paint with no pigment, is poured over a fresh photocopy of the snapshot or document. The acrylic dries and picks up the pigment from the photocopy, and then the paper is carefully scraped away, leaving a transparent image. I started building heavy layers of acrylic because I liked the texture (something like thick gummy candy) and the weight. I learned how to do some casting processes, especially latex, and then combined the two techniques. As for transparency, that’s something I don’t have a straight answer for. I love the aesthetic of transparent and translucent things. I like the metaphor of looking through something onto something else as applied to time and the past, as I think to look back into history you have to look through all the accumulated opinions and happenings and prejudices that have built up through the years. I also like the idea of a telescope that brings something far closer and visa versa. But, for the acrylic object body of work, I think the process has a ghosting effect. Making the familiar things transparent and plastic reminds me of artifacts collected from the wreck of Titanic. They just seem to be abandoned, or relics from a tomb–stuff that isn’t incorporated into daily life any longer, with an aura of death. Or that was the idea! 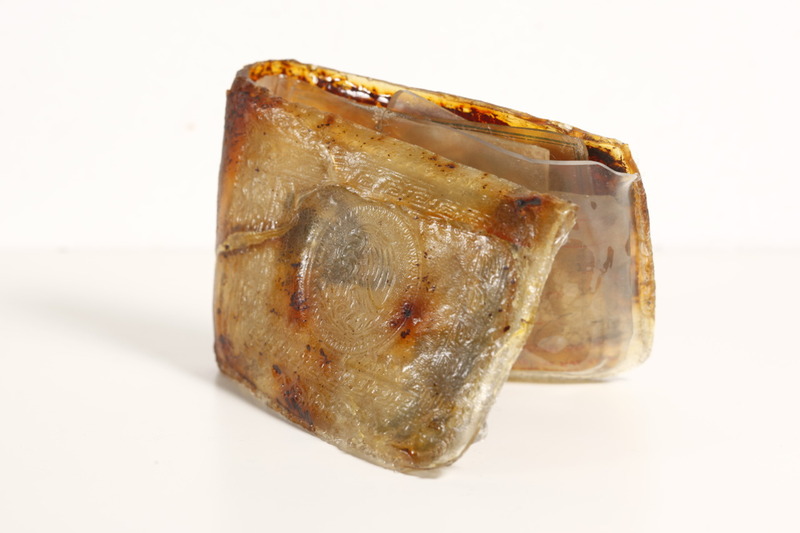 Wallet, 2011, Cast acrylic, 3 x 4 x 1 in. MHM: Finally, I’m simply curious to hear about the atmosphere you are in when you are working. Is there a certain set-up in your studio that you prefer when you work? Do you listen to music when you work? Do you like to be alone or social when you work? JS: My studio is a funny place. I usually get my thinking work done outside of the studio, mostly on public transportation. When I’m in the studio, it’s usually to do some process-heavy work, like scraping paper off the back of acrylic. So I watch a lot of movies. When I draw I like to listen to podcasts. 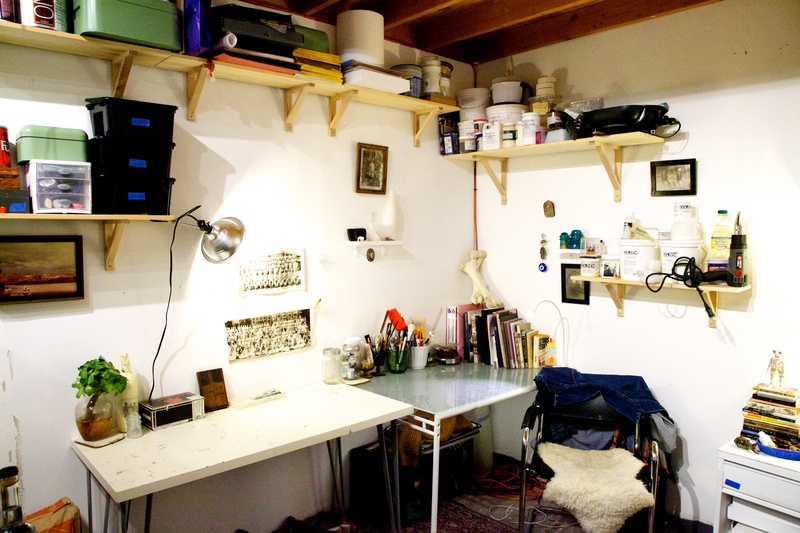 If I’m doing brainwork in the studio, it has to be quiet and alone. I need to give my thoughts time to wander. 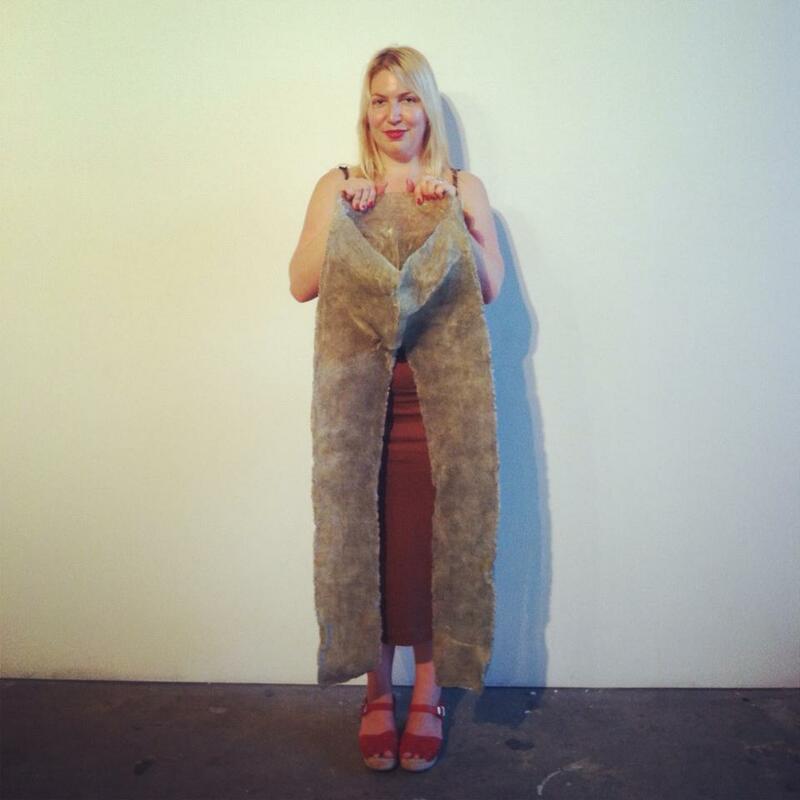 Don’t forget to join us to hear more of Julia Sackett’s thoughts, Thursday, July 25th in the Financial District at the Spare Change Artist Space (465 California St., suite 838 San Francisco, CA 94104) for an artist talk & reception 6-8 pm.